This folding book, or parabaik, consists of 21 folios and illustrates one of the many stories of the Buddha's former lives, known as 'jatakas'. This jataka tells the story of the Buddha's former incarnation as Vidura, the wise minister of a King. As the story goes, Vimala, the wife of the ocean-god Varuna, coveted Vidhura. In order to get him, she ordered the demon Punnaka to bring Vidhura to her. Punnaka managed this by the trick of enticing the King to gamble his minister in a game of dice. The king lost, and Punnaka won Vidhura and took him off to the court of Vimala and Varuna. Over time, however, Vimala and Varuna were so taken with Vidhura's wisdom that they eventually allowed him to return to his original master, the King. The episodic treatment of the story sets out the narrative in no particular order through the illustrations of the text. 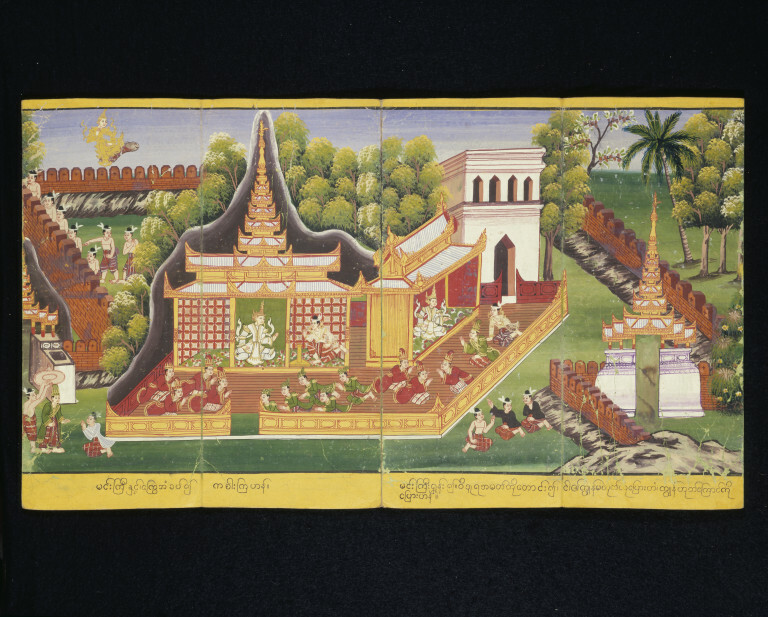 A folding book (21 folds) illustrating the "Vidura" jataka (No. 545). There is an episodic treatment of the story set out in no particular order across the 21 folds. They tell of the Buddha's former life as Vidura, a King's wise minister, who was coveted by Vimala, the wife of the ocean-god Varuna. She arranged for the yak-sa Punnaka to try to bring Vidhura to her, which he did by winning him in a game of dice with the King. Eventually Vimala and Varuna were so delighted with Vidhura's wisdom that they allowed him to return to the King. l. The four kings Sakka, Garuyla, Varuna and Dhanajaya meditate under their respective trees. 2. Vidura in the garden of Migacira with Sakka, Garula, Varuna and Dhanajaya. Judgement of who was most virtuous. 3. Probably illustrates the scene where the Naga King's wife Vinala feigns illness and asks for the heart of Vidura to cure her. 4,5,6 and 7 Scenes of Iradati's and Punnaka's courtship. 8. Punnaka finds the magic jewel. 9. Punnaka rides his magic horse around the top of the walls of the palace of King Dhanajaya and makes him walk on the leaves of a lotus bed. 10. In King Dhanajaya's Gaming Hall the King and Punnaka play at dice. Punnaka wins and asks for the King's Minister Vidura. 11. King Dhanajaya's guardian spirit (his mother in a former life) frightened by Punnaka hovers just above the palace walls. 12. In King Dhanajaya's Court of Justice Vidura judges that since he is the King's property - a slave by birth - he must be given to Punnaka. 14. Probably illustrates the scene where Vidura takes leave of Dhananjaya. king of Indaputta, at his palace gate. 15. Vidura is carried off clutching the tail of Punnaka's magic horse. 16. Punnaka attempts to kill Vidura by throwing him from a mountain top (Black Mountain). 17. Vidura sitting under a tree with Punnaka advises him that his endeavour is based on a misconception of Vimala's wishes, that she had no need for his heart she only wished to hear him discourse. 18. Vidura returns with Punnaka to the Naga Kingdom. 19. They pass a group of richly attired maidens cavorting in a pool. 20. Vidura seated on a waisted throne addresses Varuna, the Naga King, his Queen Vimala, their daughter Princess Irandati and Punnaka. 21. Irandati is given to Punnaka. 22. Vidura on a seat before Punnake rides back to Indapatta. l. Palace of Varuna - the Naga King. 2. Naga Palace and Maidens in Pool. 3. Top: Iradati's & Punnaka's courtship. Bottom: Vidura & Punnaka's reconciliation. 4. Top: Punnaka's courtship and finding the magic stone. Bottom: Vidura's trials with Punnaka. 5. Vidura's Palace and Gate to Kingdom of Indaputta. 6. King Dhanajaya's Court of Justice & Gaming Hall at Indaputta. 7. Punnaka at Indaputta & Meditation Scene. 8. Vidura & 4 Kings in Garden of Migicira. The RP's contain no mention of the donor's connection with Burma nor is there a provenance for the parabaik. However style and content place it as Burmese and quality suggests that it was formerly a court object.